Add Teachers pay Teachers to my list of Dilemmas of Openness. Teachers pay Teachers appears to be a successful private marketplace from which advocates of OER might gain valuable insights. buy and sell original teaching materials." But is their perceived success really Sounds too good to be true?! There are thousands of quality resources available on Teachers pay Teachers. We need more easy ways for teachers to share. Most teachers aren't paid what they're worth. Most teachers can't really raise a family on the salary they're given. Most teachers signed up for the job knowing both 1 and 2. Public school teachers are paid by the taxpayers - with public funds - to work during specific hours of the day. In many cases, the computer and other equipment used by public school teachers were all likely purchased by the taxpayers, using public funds. It is my belief that classroom activities, assessments, games, handouts, outlines, posters, printables, research, worksheets, and the like - that have been created by a public educator during work time or with school-owned equipment - belong to the public and should therefore be licensed with an appropriate, open license. Resources created with public funds should neither be bought nor sold by teachers because they were never the teacher's to sell in the first place. Because these resources were created with public funds, they belong to the public. But perhaps there's really no reason for me to worry. 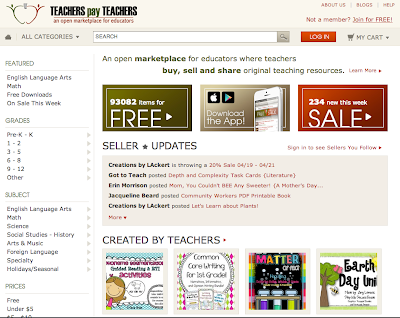 How likely is it that NONE of the (hundreds of) thousands of items for sale in the TeachersPayTeachers catalog were created with public funds? (Not) Very likely, right? IF the small business owners of Teachers pay Teachers really do aspire to the highest standards of professional ethics, THEN they would refuse to allow the sale of any publicly owned resource. First, I appreciate the passion in the comments! Please rest assured that I know teachers work very hard. I also know that most of the resources sold on TpT were created on personal time. Like you, I've been no stranger to long work days (and nights!) throughout my career as a Teacher, Teacher Specialist, and Administrator. At Jen and Sheri's request, I've done a little digging into the Administrative Code for my state (below, emphasis mine). The rules in your state may differ. Utah Administrative Code R277-111-3. Educators Sharing Materials. A. Utah educators may share materials for noncommercial use that educators have developed primarily for use in their own classes, courses or assignments. B. Utah educators may only share materials that they developed personally and may not unilaterally share materials that were purchased or developed by or on behalf of their public employer or the State. C. Utah educators may only share materials that are consistent with R277-515 Utah Educator Professional Standards. For example, educators may not share materials that advocate illegal activities or that are inconsistent with their legal and role model responsibilities as public employees and licensed educators. E. The presumption of this rule is that materials may be shared. The presumption is that Utah educators need not seek permission from their employers to share personally-developed materials. However public school employers may provide notice to employees that materials developed with public school funds or during public school employment must be reviewed by the employer prior to sharing or distribution. F. Public educators may not sell teacher curriculum materials developed in whole or in part with public education funds or developed within the employee's scope of employment to Utah educators. At this time, I haven't yet found law specifying ownership of resources created with public funds. However, in the original post above I've given number seven as my opinion and nothing more. For me, it stands to reason that if something is produced using public funds, then that something should probably belong to the public. To clarify, it has never been my intent to accuse TpT of any wrong-doing. Instead, I've pointed out an obvious dilemma. First, there are many quality resources on TpT. Second, teachers work hard and deserve to be paid more. Third, it may be easy for teachers to create resources on publicly-funded time and equipment - and then sell these resources to others in need. Fourth, if resources have been created on public time and equipment, then we probably have no right to turn around and sell them. I appreciate Teach 4th's honesty, and suspect that most TpT users fall into the same category. I absolutely LOVE how Eric Johnson has answered my final question while also offering a true-to-form critique of my writing. I honestly never meant to let him down! Finally, extra credit goes to Jen for providing the most rational and constructive comment yet! We would all do well to think of this entire dilemma in terms of opportunities. I'm having a difficult time expressing with words how much I appreciate Jen, Bill, and Jethro's willingness to rationally think through this issue with me! In my imperfection, I have attempted to shed light on a complex issue, while certainly fumbling along the way. Perhaps unlike many in the comment thread below, nevertheless, I continue to see this post as a learning experience - not a once-written-remains-written article. Throughout my blogging career, I've always tried to approach the platform in that manner. As a result, with this update I've made slight alterations to the original post. Additions to the post have been colored pink. Like Bill suggested yesterday, I no longer see the struggles I have with TpT to be dilemmas of openness. Although TpT may claim to support an "open marketplace," the implications of marketplace alone emphasize drastic differences in the philosophies of TpT and OER. Creating and using open content approaches the same problem - how do I get the best possible material to my class - from a different place. Teachers can use open content exactly as they would use a textbook, or a piece of content purchased from TpT; for many people, that is where their understanding of open content ends. However, that vision of open content is incomplete, and rooted in our habits of using material with restrictive licensing. There are different levels of using open content; teaching lessons that use open content is the starting point. Remixing material that incorporates two or more openly licensed sources is a next step. Releasing that remixed version is the next step. Collaborating with other people to edit and remix content is an additional level of involvement. And, if you look at the trajectory of using open content, it resembles the trajectory of learning. It's not a transaction (go here, buy this) - it's a series of interactions of increasing complexity, each of which requires judgment and expertise. Over time, building and using open content develops a professional network and a collection of domain level experts to work with. Working with people to create open content is some of the best ongoing professional development out there, and districts would be wise to embrace and support this reality. Rather than make absurd claims over ownership of teacher IP, they could divert some professional development money into supporting teacher time in a facilitated authoring process that spanned the course of a year. The resulting material could be released under a Creative Commons license, ensuring that teachers and the district were given the appropriate credit for their role in creating and funding the work, and material created with public money would remain available for public use. At this point, I will be moderating all comments. Only comments that constructively add to the discussion of sharing resources created with public funds/time will be considered. At this point, I'm beyond acknowledging the less-than-civil commentary left by overworked/underpaid TpT sellers who are - for whatever reason - offended by what has been written.